Stinging nettle leaf (Urtica dioica, Urtica urens) historically has been used as a nutritive tonic, diuretic, and an antiarthritc. In more recent decades, freeze dried nettle has dominated the market for its use in alleviating symptoms associated with allergic rhinitis. Modern research demonstrates that it possesses anti-inflammatory activity. While Urtica dioica species is most common, it is completely acceptable in the market to have admixtures with U. urens, a more diminutive form of stinging nettle. 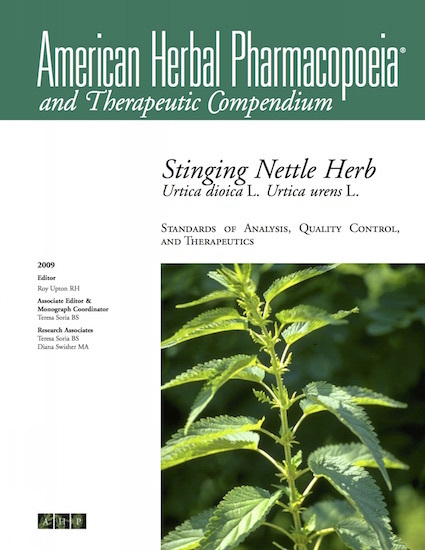 Stinging nettle is an underutilized botanical considering the prevalence of use of anti-allergy medications. AHP medical advisor and pioneer in integrative medicine, Dr Andrew Weil, regards freeze-dried nettle as one of the most beneficial preparations for allergic rhinitis.